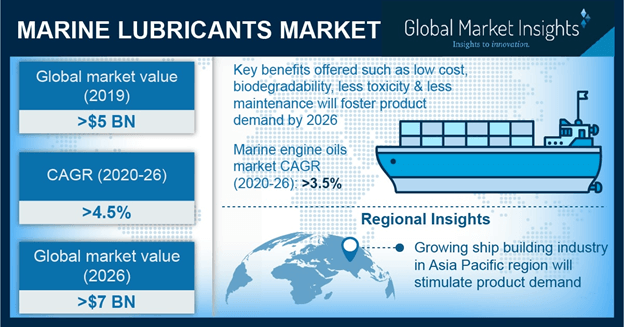 Lubricants Market « Global Market Insights, Inc.
Bio-based marine lubricants market will collect a significant revenue by 2023 with an annual growth rate of more than 6% over the coming timeframe. The deployment of stringent rules and regulations regarding the adoption of biodegradable products along with growing awareness regarding environmental protection will stimulate marine lubricants industry share notably. Hydraulic oil application segment will record an annual growth rate of more than 6% over 2016-2023. The attributing factor toward the market growth is the extensive use of the product across various marine associated services and offshore platforms. The capability of the product to provide excellent protection and reliability in corrosive environments will fuel the product requirement noticeably. Asia Pacific marine lubricants market will record an annual growth rate of 4% over the 2016-2023. Surging development in marine infrastructure across this region will augment the product demand. China, Japan, and South Korea are the prominent revenue contributors of the APAC region. Europe marine lubricants market, having had a revenue of USD 3 billion in 2015, will record considerable annual growth rate over the coming timeframe. Compliance with the bilateral trading agreements signed among the nations will lead to increased foreign trade demand, thereby augmenting the industry growth. Moreover, increasing awareness among the customers regarding the usage of eco-friendly products will also influence the regional marine lubricants market. Mineral oil marine lubricants industry, having had a revenue of USD 6 billion in 2015 will generate notable revenue over the years ahead. Increasing usage of the product for marine applications such as turbines, engines, and stern tubes will fuel the industry growth. Market players are investing heavily into the development of cost-effective products over the coming six years. The key participants in marine lubricants market are Royal Dutch Shell, ExxonMobil, Quepet Lubricants, Chevron Corporation, Gulf Oil Corporation, LUKOIL, and Sinopec. Middle East marine lubricants market will collect considerable revenue over the coming six years, owing to the rapid surge in the number of cruise ships, private yachts, and boats. More than 70% transportation in the African country of Angola is undertaken via oceanic routes. To provide advanced transportation facilities and increase the country’s cargo capacity, the government of Angola has been planning to build new ports over the years ahead. In addition, the number of natural gas and crude oil exploration activities are rising across this region, which will favorably influence marine lubricants industry growth. To establish a stronger, loyal customer base, market players have been focusing to reduce the cost of bio-based products. In addition, companies have also been forging alliances with other firms to diversify their product offering and expand their business across the globe. This entry was posted in Bulk & Specialty Chemicals and tagged Lubricants Market, lukoil marine lubricants, Marine Lubricants, Marine Lubricants market, Marine Lubricants market analysis, Marine Lubricants market Froecast, Marine Lubricants market growth, Marine Lubricants market outlook, Marine Lubricants market PDF, Marine Lubricants market price, Marine Lubricants market report, Marine Lubricants market share, Marine Lubricants market size, Marine Lubricants market trends, Marine Lubricants market update, shell marine lubricants.